Having two older brothers, there was always a plentiful supply of boys’ books and literature available for me to look at, apart from our weekly comic the Tip Top which cost 1d every week. I took to reading, like a duck to water, at a very early age, so I was able to read the speech balloons quite easily. Rupert Bear annuals were favourites of mine and had an atmosphere all their own. In recent years I’ve been reading them to my grandchildren. 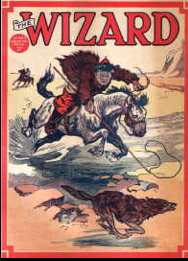 The boys’ magazines were only a short step further and soon I was avidly devouring the Wizard, Hotspur, Adventure and Rover. My favourite was the Wizard and I marvelled at some of the superhuman heroes enclosed in its pages. For some strange reason these magazines were often referred to by us as “books” and I was often asked, “Got any books to swap?” I remember we kept a cardboard box about two inches deep which was usually full of comics we’d read and were ready for swapping. My father took a daily paper The Daily Mail in which appeared, on 5th April 1915, the first ever strip cartoon in this country, Teddy Tail which, as it was still being published then, I always enjoyed reading. My father also took The People on a Sunday though at that time it was a much more serious paper and less trashy than it is today. The weekly magazine we took was “John Bull“, a well-produced magazine with a variety of thoughtful articles and plenty of pictures. Later in its existence it produced some striking and colourful artwork on its cover. They were always offering competitions and coupons to collect for bargain offers. I remember my father winning a large Christmas hamper one year which was a most welcome addition to our Christmas fare. With his collected coupons he bought – at a bargain price of course – several sets of books and encyclopaedias; these included the works of Charles Dickens, H.G.Wells and Bernard Shaw. I remember spending many happy hours leafing through the twelve encyclopaedias and particularly the section for children in each entitled Things to make and do. Having all this literature available was a great boon and I suppose laid the foundations for my love of the English language and literature which has played such an important part in my life ever since. I am a member of the Queen’s English Society and The Folio Book Club which produces some high class books well printed and bound. Apart from the bathroom, there are books in every room in the house. One of the strict rules of the Boys’ Brigade, as opposed to the Boy Scouts, was that every company had to be sponsored by a church. Consequently most companies met in a church hall or similar building. 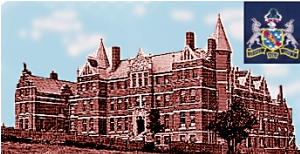 Such was the case with the company I belonged to, the 9th Eastern Valley Company, which met every week in the schoolroom of Park Terrace Methodist Church. Several years earlier, my brother Garyth and his friend, Glyn Cleaves, had joined the Boys’ brigade company at the Methodist Church in Freehold Land, Pontnewynydd which was led by Captain King. Both our families attended Park Terrace Methodist Church and, as it was a considerable trek to Freehold Land, Garyth and Glyn suggested that a new company be started at Park Terrace. Mr Jim Hamar was appointed as Captain and my brother, Garyth and his friend Glyn Cleaves, were his sergeants. The company soon built up to 20 or 30 boys and, later, had a drum and bugle band. All this happened before I was old enough to join the Boys’ brigade but I heard glowing reports about their activities such as going away to camp, and I just couldn’t wait to join. Promptly at the age of 12 I did. By then, of course, the war had started and both my brothers were in the Royal Navy and Glyn was in the Royal Air Force. I also joined the band and eventually attained the dizzy height of warrant officer. Another Boys’ Brigade rule was that all members had to attend the company Bible Class, or, as an alternative, attend a Sunday School. As I attended Park Terrace Methodist Church Sunday School until the age of 17 when we moved to Cardiff, that was not a difficulty. We also had a monthly company parade to the church, marching there with our band. One of the features at every weekly meeting was a short Biblical talk by Captain Hamar. He was a carpenter by trade and would often tell us of some of his experiences when he was a carpenter in the Canadian Royal Mounted Police. About 20 years after this photograph was taken I was working in the Nigerian bush at a teacher training college training African teachers. On one occasion, when visiting a school there, I was suddenly called upon, without any prior notice, to speak to a crowd of 300 children at a school. I was caught on the hop. Then, suddenly, I remembered one of the talks given to us by Captain Hamar and I used that. It got me out of a very awkward situation. Thank you, Captain! When I wrote my book, “Pontypool Memories” (October 2010), because of so many conflicting ideas and memories received from past students at West Mon, I did a considerable amount of research to try to discover the truth about the tragedy. I wrote the “Tragedy at West Mon” section of the book based on that research and now post below that section of the book. As I said on the “About” page – bottom of right hand column – I will not be writing this blog in chronological order. After all, some memories are more indelible than others; some even occur to me as I write. But one memory I have of my life at West Mon Boys’ School remains with me as clearly as though it happened yesterday. When I was in form 3A, that was the classroom immediately on the right as you enter the hall from the main door, there was an extra door at the front of this classroom which led out into the corridor. Immediately opposite on the other side of the corridor was another door which led into a small room. This became the new Form One. At that time there were about 80 boarders at the school. They were the same age as the rest of us but were exempt from having to sit the entrance examination. However, that year the governors had decided to start an extra class for much younger boys down to the age of six. We thought this a strange arrangement and, when we heard that they not only had to learn Latin but Greek also, we were astounded; it sounded to us like child cruelty! This was the new Form One which was quite small having only about 12 or so boys in it. I’d often wondered why the youngest class when I started at the school was known as Form Two so perhaps this was a return to something which had existed many years before, but this is only supposition on my part. Later, in 1947, an incident occurred which had a shattering impact on everyone at the school. One of the little lads from Form One, Robin Henry Lafone, of Radcliffe, Lancashire, only nine years of age, drowned in the school swimming baths. We were all horrified. The swimming baths was the place where the boys had fun. It was a heated pool and the poor ventilation system meant that you could hardly see a thing as you entered because of the cloud of water vapour permanently hanging about. But we splashed and shouted to our hearts content as we learned to swim. Mr D.C.Harrison, the Headmaster, spoke to us about the tragedy the following morning in assembly. It seemed so sad to us all that this little lad, so young, should die during a school lesson. Apparently he had dived into the baths because of a dare. His friend, John Hancher, of Birmingham, made a gallant attempt to rescue Robin and became unconscious is doing so, almost losing his own life. Of all the posts on my internet blog the account of this tragedy is one of the most frequently read. The tragedy occurred during my last year at the school and is certainly the saddest memory of my time there. Based on the large number of emails I have received about the event from past Westmonians in this and other countries, I have come to the conclusion that, over the years, the re-telling of the tragedy has led to certain inaccuracies in some accounts. In view of this I have undertaken some research into the matter and now offer what I consider to be a reasonably accurate account based on newspaper articles written at the time, the coroner’s inquest, evidence given by those who witnessed the tragic event, and the opinion of the doctor who performed the post-mortem examination. The tragedy happened on the afternoon of Wednesday 14th May 1947. The victim was nine-year-old Robin Henry Lafone who had started at the school the previous September as a Form One boarder. Because of a pact he’d made with another boy, he jumped from the spring board at the school swimming baths into six feet of water, although he could not swim. His daring cost him his life. At the Inquest The Coroner, Mr D.J.Treasure, was told by nine-year-old Martin Adam Lewis of Bridgend, a particular friend of Robin’s, that they had agreed the day before the tragedy to both jump into the deep end of the bath the next day. Martin admitted that the suggestion had come from him. He then stated that he didn’t see Robin jump in but he heard a splash and, when he looked around, he saw Robin and another boy, John Hancher, apparently fighting at the bottom of the water. He added that he thought they were just having a bit of fun. Another nine-year-old, Robert Hughes Lewis of Abertillery, said he saw Robin jump in from the springboard. He said that Robin came up splashing about and that John Hancher, a good swimmer, had dived in to help him. The Coroner asked Robert whether he thought Robin Lafone was in difficulties. He stated that the swimming bath was about 80 yards away and he immediately ran there. As he passed through the hall he saw Mr Gilbert Garnett and he accompanied him. As they went into the baths Mr Garnett threw off his coat and dived into the bath. He brought John Hancher to the side and handed him to Mr Harrison. He then went back into the water and brought Robin out. Mr Harrison said that Mr Wildash, the master who had been in charge of the swimming class, was lying on his stomach on the side of the bath in a very exhausted state. He recovered and immediately applied artificial respiration to John Hancher who came round after two or three minutes. In the meantime Mr Harrison turned his attention to Robin Lafone while medical help was being summoned. This arrived in the persons of doctors Enid and Bertram Siddons who applied artificial respiration and other forms of treatment, all without success, so Robin was taken to Pontypool Hospital for further treatment. He was given further artificial respiration by relays of ambulance workers from the GWR and from Pontnewynydd Works, but after three and a half hours, hope was abandoned. Mr Harrison went on to say that at the time there were 18 boys in the bath aged from 9 to 11. Some could swim but others were learners. Swimming was a definite subject in the curriculum and the boys were there to take the set course of instruction not to enjoy themselves. “Yes sir,” replied Mr Harrison. “You don’t think it would be safer and add to the precautions to have another master or one or two senior boys present?” asked the Coroner. “After what has happened I agree,” Mr Wildash replied. Replying to Mr W.R.Dauncey (for the Headmaster) Mr Wildash said he told the boys the rules before he let them enter the bath door. They said they knew them. He remembered seeing Lafone enter the water at the shallow end but did not see him get out again before plunging in at the other end. Gilbert Garnett, the school sports master, described how he got both boys out of the water and said he then climbed out himself and applied artificial respiration to Lafone until he was relieved. He then went to change into dry clothes. By that time Dr Siddons had arrived. The remains of Robert Lafone were cremated at Pontypridd following a largely-attended memorial service at St James’s Church, Pontypool conducted by Rev W.E.H.Williams, vicar. Mr Harrison, the Headmaster, read the lesson, and the congregation included representatives of the school teaching and boarding staffs, and many pupils. Hymns sung at St James’s were: Hail the day that sees Him rise, The strife is o’er the battle done, and Thine for ever, God of love. Organ voluntaries were played by Professor A.J.Thompson. Bearers at St James’s were: E.W.B.Blythe (head prefect), D.Owen (deputy head prefect), B.J.Kennedy (school rugby captain), D.Fraser (cricket captain), D.A.Arnott (School House captain), and D.S.Jones (Robin’s dormitory prefect). Four staff members were bearers at Pontypridd: Major C.Williams, Mr E.Stephens, Mr I.H.J.Evans (Robin’s housemaster), and Mr R.F.Witty. Mrs Lafone, who had given birth to a daughter three weeks earlier, was unable to attend the funeral. About a month later, at the school’s Annual Speech Day, John Hancher was hailed as the school hero for his brave attempt to save his friend. Amid deafening applause and cheers, he was presented with a chromium clock by the headmaster, Mr D.C.Harrison. He recalled that when the memorial service for Robin was held at St James’ Church, John was ill in bed recovering from his ordeal so was unable to attend. We heard later that Dr Lafone, Robin’s father, was presenting West Mon with a shield for life-saving, artificial respiration and coolness in crisis, to be competed for each year by the boys. I came upon this site after looking for a picture of West. Mon. and was amazed to see the sad account of the drowning. The boy who ran for help was myself. I was a boarder at that time . . . I returned to the school a few years ago, but most things have changed, the dormitories, swimming bath, are no more. I have been reading through the accounts of this sad accident, which has brought many memories back again. I was the boy who ran for help and was in the same class as Hancher and Lafone. Lafone was a close friend and sat next to me in class. The day’s events of this tragedy will be with me always, and sadly the circumstances of the accident were not as generally accepted. The teacher in charge was unable to swim, and my memory of him in the water hanging on to the side of the Baths with his gown still on, is as clear now as then. I ran for help to a classroom on the ground floor, and the teacher attempted to save both boys. I was a boarder at the school, having moved down from London in 1945? until 1950. The master in the water with gown was not the teacher that I went for help to. [I cannot recall his name.] The teacher that I went to in a class came back with me and dived in to try and save the boys. My recollection was that Garnett was not there. I did wonder why the boys were not questioned at the time about the event, but maybe we were all thought to be too young to be reliable witnesses. Lafone jumped in, as he had been dared to by the boys, and he had been told to jump in from the deep end of the baths and jump towards the side so he could get out, although he admitted he could not swim I think he felt he could not lose face. It was a journey of only a few yards to move from Town School Infants to the Juniors. Classes one and two were at the Infants’ end of the corridor. It was another large room and divided by a heavy green curtain. Class one was taught by Miss Lewis, a cheerful, red-faced dumpy character who was the sister of Mr J.P. Lewis, the headmaster. The younger Miss Gameson, tall, angular and not very experienced, taught the second class. The furthest extremity of this room was partitioned off as the staff room. Two other classrooms in that building ran off the same narrow corridor where Mr Hughes and Mr Rees taught. These were separated – more splendidly than classes one and two – by a sliding glass partition. It didn’t slide all that well so it was only opened on really special occasions. Finally, at the end of the corridor, there was the hallowed ground of the headmaster’s office, large and lino’d with high, glass-fronted cupboards containing the precious stock of books, pencils, rulers etc. Around the corner was another corridor with class three off it where Miss Brooks taught, and at the end, the porch which contained the hand-basins and hooks for coats for use by the boys. Narrow double doors off this corridor also gave access to the small playground where we also did our “drill”. (There is a photograph of this playground in my much later post on the Centenary Book.) On the far side were the boys’ toilets. The girls’ toilets and cloakroom were in another room at the back of the building. The heating for these classes was provided by iron tortoise stoves. In winter, the luckless caretaker had to arrive at work at the crack of dawn to light the temperamental stoves which were often difficult to get going, but, once they were alight they provided a great deal of heat so that it was impossible to sit too near. Sometimes the tops glowed red with the heat. On severe winter days when we could hardly write because of cold fingers, we were allowed to go out in twos and threes to warm our hands by the stove for a few minutes. In those days it was common to refer to the classes as “standard one” and “standard two” etc. This was because, previously, you only advanced from one class to the next when you had reached a certain standard, not on your age. Consequently you could get a mixture of ages in the same class. Promotion according to age was not fully implemented at the time I’m speaking about and there could be a slight overlapping of ages; for instance, I was in the “scholarship class” for two years. The only other classroom was known as “the bungalow”. This was on higher ground at the back of the main building and was reached by a flight of stone steps. It was figuratively and literally “a cut above the rest” as it contained class four, which was “the eleven plus class” and was also referred to as “the scholarship class”. Scholarship indeed! Each year about half the children opted to enter the examination which might lead to a grammar school education. To urge us on in this ambition, our teachers constantly reminded us that success in this examination was the only way to ensure a really good job when we left school. The class was in the very capable hands of Mr Petty, the finest and most dedicated teacher who ever taught me. He had such a dynamic effect on my life that I want to say a lot more about him in a future entry. The room had a small cloakroom just inside the door and the rest was used as the classroom. Right at the front, near the teacher’s high desk, was a coal fire with a high metal guard. This was the only form of heating so that, if you were unlucky enough to be seated at the back of the room, there was an advantage in that it was difficult for the teacher to see what you were doing, but a disadvantage in that you were in danger of freezing in the winter. Sometimes the temperature was so low that we were allowed to sit with our coats and gloves on. Lighting was provided by a series of gas lamps high up on the walls around the room. They weren’t often used as it necessitated Mr Petty walking around the class with a lighted piece of paper in his hand and turning on and lighting each globe separately; and, obviously, doing a second round later to turn them off. There was one advantage of being in class four: to the side and rear of the classroom was a small playground and this was reserved for class four children only. Compared with the spanking new Park Terrace school, a short distance away, resplendent in red brick with the novelty of a playground on the roof, Town School was traditional, solid, being built of stone, in rather poor repair and very old, having been built in 1838 as the plaque on the outside wall announced to all who passed by. I well remember the high jinks and celebrations in 1938 when we celebrated the centenary of the school. I still have the small booklet which was issued to us all at the time as part of those celebrations. See my much later blog on the contents of this booklet. Even the glass partition was pushed back to enable the headmaster to talk to two classes at once. One of my favourite comic characters, Popeye the Sailorman, made his entry into the world the same year as I did – 1929; but there was a difference: he became famous and I didn’t. Other famous people born the same year were Audrey Hepburn, James Last, Martin Luther King and Anne Frank. It was the year that television was first demonstrated by Bell Laboratories in New York, but a practical system was said to be a long way off. In London the first 22 public telephone boxes came into use, and, importantly, the England cricket team retained the Ashes. 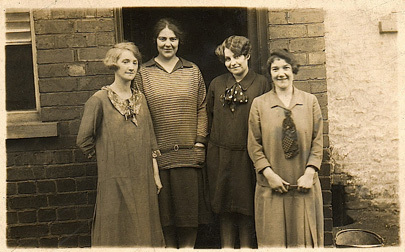 I was born at 7 Wern Terrace, High Street and was to live there for my first seven years. About 18 months later another baby boy was born next door at number 8. He was Eric Smith and became my best friend throughout our school days. He too was the youngest member of his family, having an older sister, Mary. Both being regarded as “too young” to play with our older siblings, we always played together and with other same-age friends either in one of the houses or gardens of numbers 7 and 8. Soon we were allowed to play in the lane at the back of Wern Terrace and it was there that we played cricket, football, rode our three-wheeler bikes and spent many happy hours slaughtering hoardes of red indians with our cap guns. My eldest brother, John, was born six years earlier and went to the nearest school, Pontypool Town School, where my other brother, Garyth, soon followed. The new Park Terrace School had not been built at that time. Naturally, I also went to Town School. It was a very old Church of England School and I clearly remember the centenary celebrations in 1938 when I attended the junior section of the school. I started in the infants section rather earlier than I should have because an aunt of mine did some pupil teaching there and I think she was able to pull a few strings. Pupil teaching was an allowed arrangement for the benefit of young people who wanted to become teachers and were thinking of going to a teacher training college; they did a bit of practice in a school before doing so. The infants section had two rooms. The first class (usually known as “reception” these days) was a room on its own. It was in this class that I remember we used “slates”. Actually they were not like the original slates which were pieces of slate used for writing on. These were made of thin wood painted black and with a frame around them. We practised writing on these with chalk and used small pieces of wet cloth for erasing. In the corner of the classroom was a rocking horse which we were allowed to ride on from time to time. It always struck me as huge but, having seen photographs of it since, it wasn’t all that large. name of the other boy. Any ideas? to know who they are. They’ll be well over 80 now! There were various theories and experiments carried out in schools even in those days (we seem to delight in using children as guinea pigs) and I remember that it was considered a good idea for all children in the first class of infants schools to have a nap in the afternoon. As a result of this we were all supplied with camp beds and had to lie on them for about half an hour. We were told that we had to go to sleep but I can never remember doing so. Classes two and three were in the next room. It was very large and was divided down the middle by a large heavy green curtain. Things became rather more exciting in there and I remember having to copy the drawings of objects from a large flip-chart, each object related to a letter of the alphabet – “A for apple” etc. I really loved doing that and we had to repeat it time and time again. In the third class we had a percussion band with bells, triangles, tambourines and drums. Wow! Fortunately I was chosen to be a drummer and I loved it. You could make such a glorious noise with a drum. Unfortunately, when I was absent for a short while due to illness, someone else was chosen as drummer in my place and I was reduced to a triangle player. I was devastated! Our percussion band resplendent in hats. I think I remember some names from left to right. Kenny Rice, John Evans?, Ray Hurcombe. 5th from left I think is Jane Grey. I’d love to hear from any of these who recognise themselves. The Folly Tower is built on a ridge so that it can be seen for many miles around and, conversely, it commands magnificent views of the surrounding countryside; it is claimed that seven counties can be seen on a clear day. It was built by John Hanbury in 1772 as a summerhouse for him and his family. My earliest memories of the tower in the 1930s recall that it was in a state of disrepair, though worse was to follow. I remember the surprise I had one day in the war when, on Tuesday, 9th July 1940, I came home from school and walked down the garden path at my home in School Lane, Wainfelin. Usually, looking to the right it had always been possible to see the Folly standing up on the crest of the hill, but on this particular day it looked as though someone had cut it in half from top to bottom. It had been rumoured that the tower would have to be taken down because German bombers used it as a marker to try to locate the ordnance factory near Usk, known to Pontypool people as “The Dump”. I don’t know whether they hadn’t used enough explosives to complete the demolition or whether they needed to demolish it in two stages, but soon the job was completed and the Folly was no more, just a heap of old stones. A promise had been made at the time that, when the war was over, the tower would be restored but it was many years after the war before that promise was kept. 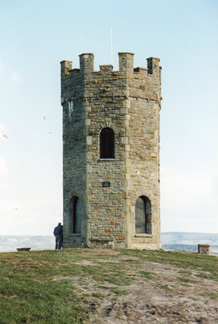 In 1990 a committee was set up with the aim of restoring the old tower and was successful in obtaining funding for the project from various organisations. As it was destroyed to further the cause of freedom throughout Europe I think it was appropriate that the E.U. should have contributed to its restoration. 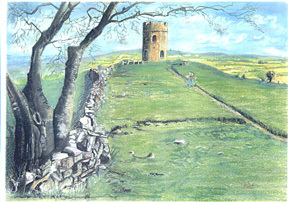 The “Campaign to Rebuild the Old Folly Tower” (CROFT) was launched and finally raised enough money for the work to start in 1991. Three years later it was completed. It was officially opened on 22nd July 1994 by the Prince of Wales, almost exactly 54 years after I’d seen it demolished. The Folly Tower has always had a special place in the hearts of the people of Pontypool. When travelling home by train you knew, when you came in sight of the Folly, that you were almost there. From time to time I pay a visit to some of my old Pontypool haunts just to see if anything has changed. On one visit to the Folly, I was pleased to see that it had been restored to its former glory. I therefore made a return visit to paint the above pastel painting of the scene. For those who might prefer a photograph instead of my painting above, I append below a photograph of the Folly I took on the day I did the painting. Echoes of dreamland shall bear them along. I remember, at the time, feeling slightly nostalgic when I heard the words and thinking what a far-distant time we were singing about; although I did wonder how far flung we might all be and what we might be doing in forty years’ time. Now I’m looking back, not over forty years, but well over seventy and I really do wonder what all those boys are doing and where they are. So I decided to start this blog. It’s possible that some of those old school friends might see it. I expect that there are old westmonians not only scattered all over the UK but all over the world. They might like to recall those “visions of boyhood” of yesteryear. It’s not my intention to make this blog another “history of Pontypool” as there are plenty of those about already. This will be an intensely personal collection of recollections, almost at random as they occur to me; and I don’t want them necessarily to be only my recollections. If any visitors have any they’d like to share, I’d love to hear about them. This doesn’t mean only old westmonians of course, but everybody who’s ever lived in Pontypool and its surroundings.